1دانشجوی دکتری، گروه روان‌شناسی تربیتی، دانشکده روان‌شناسی و علوم تربیتی، دانشگاه سمنان، ایران. 2استادیار گروه روان‌شناسی تربیتی، دانشکده روان‌شناسی و علوم تربیتی، دانشگاه سمنان، سمنان، ایران. 4استادیار گروه روان‌شناسی بالینی، دانشکده روان‌شناسی و علوم تربیتی، دانشگاه سمنان، سمنان، ایران. 5دانشیار گروه روان‌شناسی بالینی، دانشکده روان‌شناسی و علوم تربیتی، دانشگاه سمنان، سمنان، ایران. هدف این پژوهش بررسی اثربخشی آموزشی شکوفایی بر مؤلفه‌های شکوفایی شامل هیجان‌های مثبت، روابط، معنا، مجذوبیت و پیشرفت پژوهشگران جوان و نخبگان است. طرح پژوهش به‌صورت شبه‌آزمایشی است که با بهره‌گیری از طرح پیش‌آزمون، پس‌آزمون با گروه کنترل انجام شده است. جامعه آماری را اعضای باشگاه پژوهشگران جوان و نخبگان دانشگاه آزاد اسلامی در واحدهای شهر تهران در سال 1396- 1395 تشکیل داده‌اند. نمونه پژوهش را چهل نفر از اعضای باشگاه پژوهشگران جوان و نخبگان که در همه مؤلفه‌های شکوفایی نمره‌ای پایین‌تر از میانگین کسب کرده بودند، تشکیل می‌دهند. این چهل نفر به‌صورت تصادفی به دو گروه بیست‌نفره تقسیم شدند و با همین روش یکی از گروه‌ها به‌عنوان گروه آزمایش و گروه دیگر به‌عنوان گروه کنترل در نظر گرفته شد. 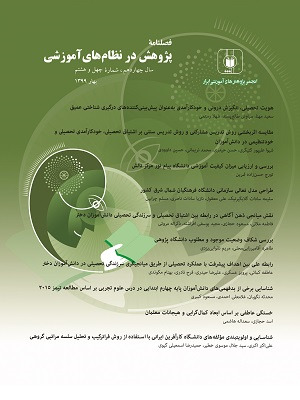 پیش از شروع دوره آموزشی، هر دو گروه مقیاس شکوفایی باتلر و کرن (2015) را تکمیل کردند و سپس پروتکل آموزشی‌ـ‌مداخلة شکوفایی، به گروه آزمایش طی هشت جلسة دو ‌ساعته در دو روز آموزش داده شد. به گروه گواه در این زمینه آموزشی داده نشد. در پایان دوره، هر دو گروه دوباره پرسش‌نامه را تکمیل کردند. داده‌ها با روش تحلیل کوواریانس چند متغیره و تک‌متغیره تحلیل شد.یافته‌ها نشان داد برنامة مذکور به‌طور معنی‌داری مؤلفه‌های شکوفایی گروه آزمایش را در مقایسه با گروه کنترل افزایش داده است. این برنامه می‌تواند در بهبود مؤلفه‌های شکوفایی (هیجان مثبت، مجذوبیت، روابط، معنا و پیشرفت) مؤثر واقع شود. جامعه‌ای می‌تواند به بالندگی و خودکفایی برسد که با ایجاد شرایط و امکانات لازم، زمینه پرورش و شکوفایی توانمندی‌ها و استعدادهای برتر را آماده کند؛ لذا استفاده از مداخلة شکوفایی با هدف ارتقای شکوفایی نخبگان توصیه می‌شود. اساس‌نامة باشگاه پژوهشگران جوان و نخبگان، مصوب 22 فروردین 1378 هیئت‌امنای دانشگاه آزاد اسلامی. کارنامة رشد باشگاه پژوهشگران جوان و نخبگان، تهران: سازمان چاپ و انتشارات دانشگاه آزاد اسلامی (1395)، جلد 2. ساداتی فیروزآبادی، سمیه (1394). رابطه کمال‌گرایی با اضطراب حالتی/ خصلتی در دانش‌آموزان دبیرستانی تیزهوش. فصلنامه علمی و پژوهشی پژوهش در یادگیری آموزشگاهی و مجازی، 2(8)، 110-99. فروزنده دهکردی، زهرا (1391). بررسی مقایسه‌ای سبک‌های اسناد و مهارت ابراز وجود در دانش آموزان تیزهوش و عادی دختر سال اول مقطع متوسطه شهرستان شهرکرد. پایان‌نامة کارشناسی ارشد رشتة روان‌شناسی عمومی دانشکدة پردیس نیمه‌حضوری دانشگاه علامه طباطبایی. Amabile, T.M., Barsade, S. G., Mueller, J. S., & Staw, B.M. (2005). Affect and creativity at work. Administrative Science Quarterly, 50, 367–403. Antonovsky, A. (1993). The structure and properties of the sense of coherence scale. Social Science and Medicine, 36, 725–733. Bakker, A.B., & Oerlemans, W. (2011). Subjective well-being in organizations. In K.S. Cameron, & G.M. Spreitzer (Eds. ), The Oxford Handbook of Positive OrganizationalScholarship (pp. 178–189). New York: Oxford University Press. Bakker, A.B., & Schaufeli, W.B. (2008). Positive organizational behavior: Engaged employees in flourishing organizations. Journal of Organizational Behavior, 29,147–154. Barber, L., K. Bagsby, P., G. & Munz, D., C. (2010). Affect regulation strategies for promoting (or preventing) flourishingemotional health. Personality and Individual Difference, 49, 663-666. Butler,J.,&Kern,M.L. (2015). The PERMA-‐Profiler: A brief multidimensional measure of flourishing International journal of wellbeing, 6(3): 1-48. Catalino, L.,I. & Fredrickson, B.L. (2011). A Tuesday in the life of aflourisher: The role of positive emotional reactivity in optimalmental health. Emotion, 11, 938-950. Diener, E., D. Oishi, Sh. & Lucas, R., E. (2003). Personality, culture, and subjective well-being: Emotional and cognitive evaluations of life. Annual review of psychology, 54(1), 403-425. Diener, E., D.& Biswas‐Diener, R. (2008). Measuring Psychological Wealth: Your Well‐Being Balance Sheet. Happiness: Unlocking the Mysteries of Psychological Wealth, 234-243. Diener, E., Helliwell, J. F., & Kahneman, D. (Eds.). (2010a). International differences in well-being. NewYork: Oxford University Press. Diener, E., Wirtz, D., Tov, W., Kim-Prieto, C., Choi, D.W., Oishi, S., &Biswas-Diener, R. (2010). New well-being measures: Short scalesto assess flourishing and positive and negative feelings. SocialIndicator Research, 97, 143-156. Dolan, P., Peasgood, T., & White, M. P. (2008). Do we really know what makes us happy? A review of theeconomic literature on the factors associated with subjective wellbeing. Journal of Economic Psychology, 29, 94–122. Faulk, K.E., Gloria, C.T., & Steinhardt, M.A. (2013). Coping profilescharacterize individual flourishing, languishing, and depression. Anxiety, Stress & Coping: An International Journal, 26, 378-390. Feicht, T. Wittmann, M. Jose, G. Mock, A. Von Hirschhausen, E. & Esch, T. (2013). Evaluation of a Seven-Week Web-Based Happiness Training to Improve Psychological Well-Being, Reduce Stress, and Enhance Mindfulness and Flourishing: A Randomized Controlled Occupational Health Study. Evidence-Based Complementary and Alternative Medicine, 2013, 14. Feicht, T. Wittmann, M. Jose, G. Mock, A. Von Hirschhausen, E. & Esch, T. (2013). Evaluation of a Seven-Week Web-Based Happiness Training to Improve Psychological Well-Being, Reduce Stress, and Enhance Mindfulness and Flourishing: A Randomized Controlled Occupational Health Study. Evidence-Based Complementary and Alternative Medicine, 1-14. Fredrickson, B, L. Losada, M, F. (2005). Positive Affect and Complex Dynamics of Human Flourishing. American Psychologist, 60, 7, 678-686. Fredrickson, B., L. (2001). The role of positive emotions in positive psychology: The broaden-and-build theory of positive emotions. American Psychologist, 56, 218–226. Fredrickson, B., L. Losada, M, F. (2005). Positive Affect and Complex Dynamics of Human Flourishing. American Psychologist, 60, 7, 678-686. Gokcen, N., Hefferon, K., & Attree, E. (2012). University students’constructions of ‘flourishing’ in British higher education: Aninductive content analysis. International Journal of Wellbeing, 2,1-21. Hill T, E. (1999). Happiness and Human Flourishing in Kant's Ethics. Social Philosophy and Policy, 16(01):143-757. Huppert, F. A. (2009a).A new approach to reducing disorder and improving well-being. In E. Diener (Ed.) Perspectives on psychological science, 4, 108–111. Huppert, F. A. (2009b). Psychological well-being: Evidence regarding its causes and consequences. Applied Psychology: Health and Well-being, 1, 137–164. Huppert, F. A., & So, T. C. (2013). Flourishing across Europe: Application of a new conceptual framework for defining well-being. Social Indicators Research, 110(3), 837-861. Huppert, F.A. (2009). Psychological well-being: Evidence regardingits causes and consequences. Applied Psychology: Health and Wellbeing,1, 137-164. Jahoda, M. (1958). Current concepts of positive mental health. New York: Basic Books. Keyes, C. L. M. (2002). The Mental Health Continuum: From languishing to flourishing in life. Journal of Health and Social Behavior, 43(2), 207-222. Keyes, C. L. M. (2005). Mental illness and/or mental health? Investigating axioms of the complete state model of health [Research Support, Non-U.S. Gov't]. Journal of Consulting and Clinical Psychology,73(3), 539-548. Lamers, S. M. A., Westerhof, G. J., Bohlmeijer, E. T., ten Klooster, P. M., & Keyes, C. L. M. (2011). Evaluating the psychometric properties of the Mental Health Continuum—Short Form (MHC—SF). Journal of Clinical Psychology, 67(1), 99-110. Licinio, J. (2016). PERMA: Positive emotion, Engagement, Relationships, Meaning and Accomplishment+Optimism, Physical Activity, Nutrition and Sleep. Australia: South Australian Health & Medical Research Institute(SAHMRI). Lyubomirsky, S., Sheldon, K. M., & Schkade, D. (2005). Pursuing happiness: The architecture of sustainablechange. Review of General Psychology, 9, 111–131. Michalec, B., Keyes, C.L.M., & Nalkur, S. (2009). Flourishing. In: Lopez, S.J. (Ed. ), The encyclopedia of positive psychology (Vol. I, pp.391-394). Chichester, England: Wiley-Blackwell. Ryan, R. M., & Deci, E. L. (2001). On happiness and human potentials: A review of research on hedonic and eudaimonic well-being. Annual Review of Psychology, 52, 141–166. Ryff, C. D. (1989). Beyond Ponce de Leon and life satisfaction: New directions in quest of successful aging. International Journal of Behavioral Development, 12, 35–55. Seligman M, E. (1999). The president’s address. American Psychologist, 54. 559-562. Seligman, M, E. (2011). Flourish: A Visionary New Understanding of Happiness and Well-being. New York: free Press. Seligman, M. E. (2011). Learned optimism: How to change your mind and your life. New York: Vintage. Sha, E. Y. (2011). Resilience, Character Strengths and Flourishing: A Positive Education Workshop for Singapore Teachers. University of Pennsylvania Scholarly Commons. Master of Applied Positive Psychology (MAPP) Capstone Projects. Positive Psychology Center. happycoachee@gmail.com. 8-1. Stoeber, J. & Corr, P., J. (2016). A short empirical note on perfectionism and flourishing. Personality and Individual Difference, 90, 50-53. Telef, B.B. (2011). The validity and reliability of the Turkish versionof the Psychological Well-being Scale. Paper presented at the11th National Congress of Counseling and Guidance, Izmir,Turkey. Tims, M., & Bakker, A.B. (2010). Job crafting: Towards a new model of individual job redesign. South African Journal of Industrial Psychology, 36, 1–9. Tugade, M. M. & Fredrickson, B. L. (2004). Resilient individuals use positive emotionsto bounce back from negative emotional experiences. Journal of Personality and SocialPsychology, 86, 320-333. doi: 10.1037/0022-3514.86.2.320. Vohs, K.D., Baumeister, R.F., & Ciarocco, N.J. (2005). Self-regulation and self-presentation: Regulatory resource depletion impairs impression management and effortfulself-presentation depletes regulatory resources. Journal of Personality and Social Psychology, 88, 632–657. Wood, J.V., Saltzberg, J.A., & Goldsamt, L.A. (1990). Does affect induce self-focused attention? Journal of Personality and Social Psychology, 58, 899–908. Wrzesniewski, A., & Dutton, J.E. (2001). Crafting a job: revisioning employees as active crafters of their own work. Academy of Management Review, 26, 179–201. Younkins, E, W. (2010). Human Nature, Flourishing, and Happiness:Towards A Sunthesis Of Aristotelianism, Austrian Economic, Positive Psychology, And Aynrand’s Objectivism. Libertarian Papers, 2, 35.